The reality of Czech party politics, although oriented towards ‘standard’ Western European parties, has, of course, very differently. Parties have typically been closed rather than open; attractive to limited numbers of citizens; organisations with largely passive paper membership rather hotbeds of political activism; collusive rather than competitive; and deeply vulnerable to capture by corrupt vested interests. With the possible exception of the Communists (KSČM) and Christian Democrats (KDU-ČSL) the country’s political parties seem shell-like bodies, which de facto are loose alliances of elite groups and political professionals, overlapping more with the worlds of business and public administration than with the life of grassroots communities. 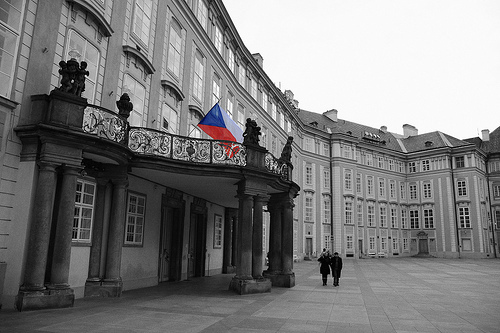 Although constitutionally and legally privileged, Czech parties are, in many ways, weak organisations. This state of affairs is well diagnosed in the 9-point programme of the Czech anti-corruption alliance Reconstruction of the State. Three of its key planks (on abolition of anonymous shares; declaration of assets; a transparent legislative process suppressing the phenomenon of dubious last minute amendments (přílepky) concern the assets or activities of individual politicians or businesspeople, while only one (on political finance) deals directly with parties. The latter, of course, matters. The Czech Republic’s regime for regulating party finance lags far behind that of other European countries and is one of the areas where least progress has been made. Corruption and the exploitation of the state are not just about personal gain, but about topping up the resources needed to win elections and hold power. Money – whether in the form of state contributions and legitimate donations, or kickbacks and covert sponsoring – has become the lifeblood of democratic party politics, substituting for the mass memberships, grassroots campaigning and ties to Interest groups that largely failed to materialise after 1989. Here too the stress on making politicians’ management of public assets transparent and water-tight and regulating parties’ assets, rather than activities, soberly addresses Czech democracy as it really is, rather than we might wish it to be. We are left with the prospect of transparent, better functioning and more legitimate democracy, but a democracy that is still of small elites and big money. This might dismay many. It is very far from the legal fiction of Czech constitutional law. But it is not necessarily something to shy away from. Political parties in even the well-functioning European democracies are, to use the phrase of the Dutch political scientist Ingrid van Biezen increasingly ‘public utilities’ rather than voluntary organisations rooted in local civil society. In other words, for most citizens, parties are more akin to their phone provider or their health insurer than, say, their local sports club which they might come into direct day-to-day contact with, join and participate in. The logic of this is that like economic subjects, parties and politicians – as Reconstruction of the State’s research concludes – need strong, independent and strongly enforced regulation and high levels of transparency. Indeed, if we see parties as professionalised providers, there may be an argument for transparency to be extended beyond political finances and expenditure. Estonia, for example, insists on a public online register of all party members. To judge from current trends – in particular, the emergence of Public Affairs (VV), TOP09, Dawn Úsvit and, of course, Babiš’s ANO – successful Czech parties of the future will be looser, more mutable and more short-lived creations, built top-down non-party and minor party candidates; forging temporary alliances with regional groupings or independents’ movements; and recruiting technocrats, NGO activists and even celebrities. This may make for a more interesting, and perhaps in some ways perhaps a more democratic politics, but will pose new challenges of regulation. But it is the political rise of Andrej Babiš and ANO that pose the starkest – and least addressed – challenges. Babiš and his movement are complex phenomenon. Its rise (like that of VV in 2010) has opened upon political opportunities for real change fed into a broader anti-corruption consensus. But, as illustrated by the biofuel controversy, the convergence of public policy with the commercial interests of a conglomerate raise huge conflicts of interest, which are of quite different nature from the tangled webs woven by the shady power-brokers known as ‘regional godfathers’ (krajští kmotři) and their political clients. Such conflicts are so readily apparent, they are grudgingly acknowledged by Babiš himself and members of his party. According to TNS AISA’s polling for Czech Television even one in four of Babiš’s own voters believe he has unresolved conflicts of interest. One might imagine beefed up legislation would bar Babiš’s firms from bidding for state contracts, although this is politically unlikely. However, the real issues lie elsewhere: it as much the concentration of power as direct conflicts of interests that pose problems. The ‘public control’ of politicians and parties enabled by transparency laws assumes a key role for a diverse and independent media easily stifled (or distorted) if these same politicians can constraint journalists, either through private ownership or through political pressures on public broadcasters. The media thus appears a further (quasi-) institution whose role as watchdog and brake on power needs cultivating and protecting. An underlying issue, however, is the problem of democratic politics (or rather anti-politics). Mr Babiš won his mandate on an anti-political appeal of putting a billionaire ‘doer’- hence an automatic clash of public and private interests – at the heart of government. Many voters seem to assume that all politicians, especially conventional party politician, are so indelibly tainted with conflicts of interest, this is the lesser evil. In the long term, a well-functioning democracy needs not just well designed, independent state institutions and well-trained career officials, but also professional party politicians who, while not necessarily loved or admired by the public, are not automatically assumed to be corrupt servants of vested interests. This post was written as a contribution to the #Brzdy_moci (‘Braking Power’) debate organised by the anti-corruption platform Prague-based Rekonstrukce státu. « Czech Republic: How bad is Babiš?